Looking just at the arm-soc changes, nvidia has had a bit of fluctuation over the years, with almost no changes sent bteween linux-4.12 and 4.18, but a lot for 5.0 and 5.1. Mellanox also have a very nice ARM platform (bluefield) that they are in the process of getting fully supported now. 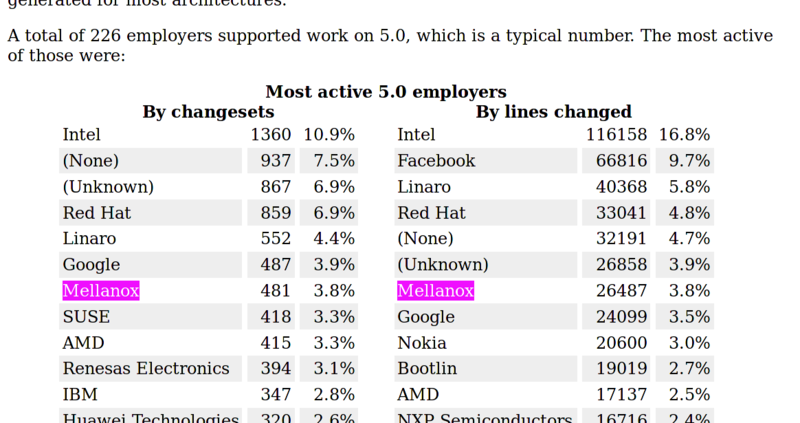 Mellanox' contributions to date are almost exclusively for infiniband and networking, in particular their own drivers, but also generic network infrastructure code that they are interesting in.